I didn’t know much about human rights lawyer Shahid Azmi before watching Hansal Mehta’s film, and I’m not entirely sure that I know a lot more about the real man even after watching. There is a disclaimer at the start, which flashes past very quickly but suggests that the film is a dramatised version of events in the life of the murdered lawyer rather than a strict doco-style exposé. But whatever the true story, the film is a fascinating look at a man who refused to back down and spent most of his career standing up for people who would otherwise never have had a voice. 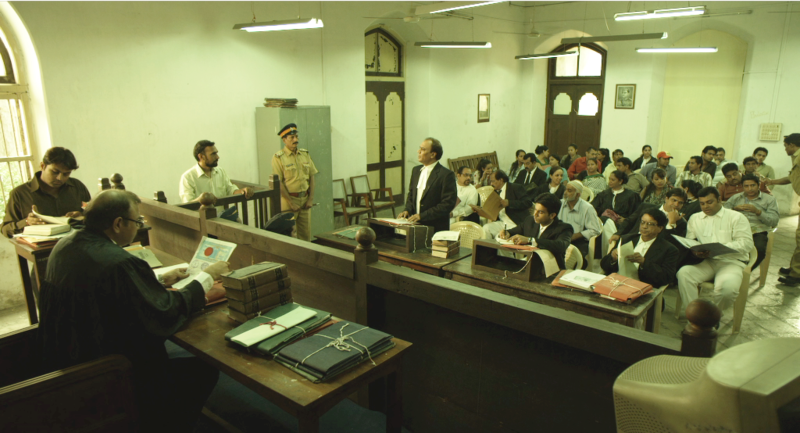 Shahid may be a romanticised and somewhat sanitised account, but it still delivers its message and brings the Indian judicial system squarely into the limelight. 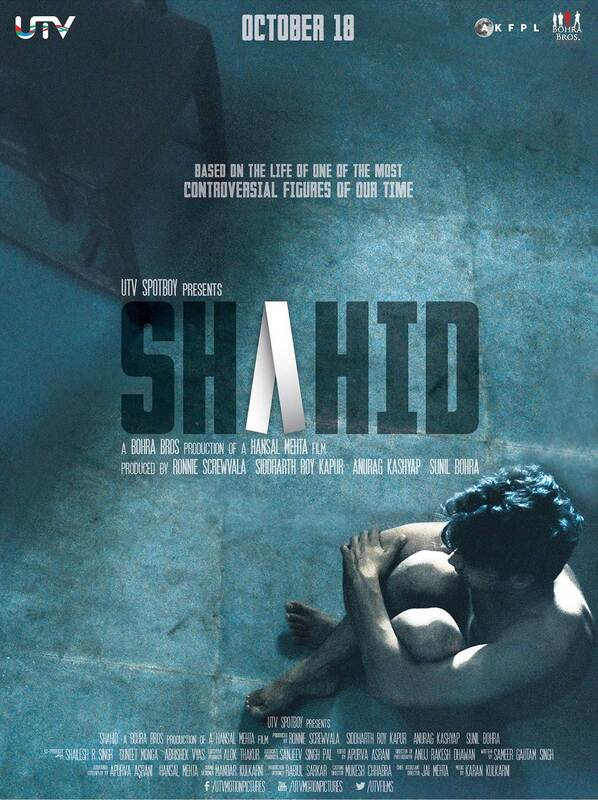 The film starts with the end of Shahid Azmi’s life, at the moment when he is shot by persons unknown in his office. It then moves immediately back several years to the early 90’s when a young Shahid is caught up in the violence of an attack on his community in Mumbai. 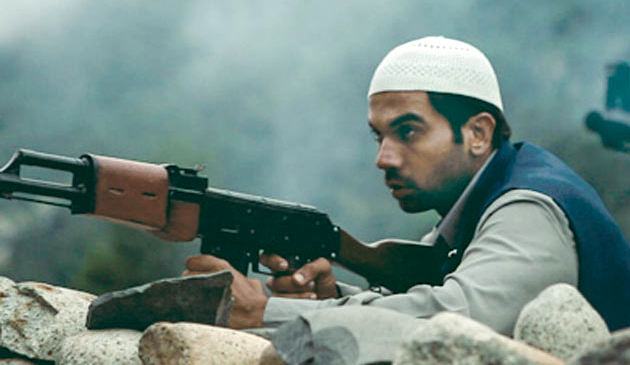 As a result Shahid ends up in a terrorist training camp, although the why and how he got there is never shown and the whole episode is quickly glossed over during the credit sequence. However Shahid’s revulsion at the violence of the camp is clearly shown although his escape from the over-zealous terrorists is only briefly mentioned. 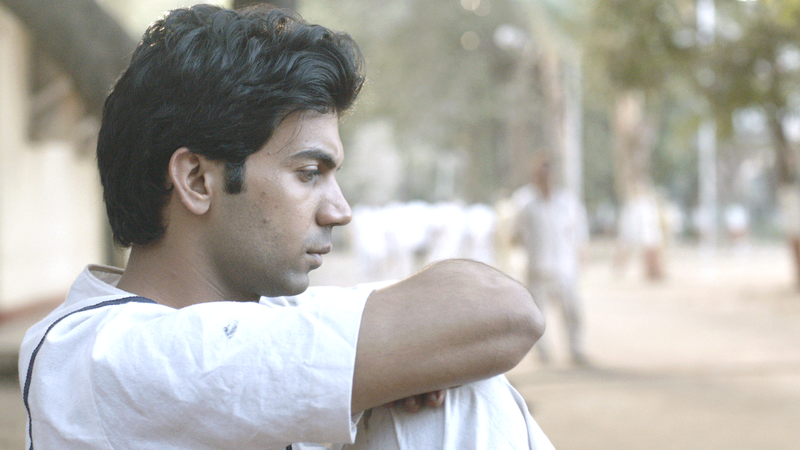 On his return to his family, Shahid is arrested and eventually tricked into signing a confession which results in time spent in jail. Interestingly Kay Kay Menon plays one of his mentors in the jail, which seemed odd since I’m more used to seeing him play a more negative role. However, he’s very effective in the role of War saab who persuades Shahid to make the most of his time in jail and get an education. This he does, finally becoming a lawyer and taking on cases for clients like his younger self – people with no money who have been imprisoned on terrorist charges without any real evidence. 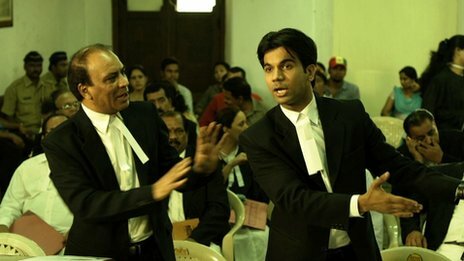 It’s compelling viewing, mainly due to an excellent performance by Raj Kumar Yadav who is charismatic and very believable as the passionate young lawyer. He starts off small and works for a criminal lawyer Maqbool Menon (Tigmanshu Dhulia) which is where he meets Mariam (Prabhleen Sandhu), a client who needs help with a property case. In the process of fighting her case, Shahid falls in love and this is the only part of the film that feels in any way filmi, as the two walk along the beach and share some classic Bollywood romantic moments together. Prabhleen Sandhu starts off well, but after her marriage I expected her to show more frustration with Shahid’s absorption with his career but instead she is very passive. Mariam also doesn’t show much fear or apprehension about the death threats made to her husband, and the couple’s final showdown feels contrived compared to the rest of the film. This could just be down to the writers, but her performance was stilted in parts, particularly in comparison to the other actors. Mariam is divorced with a young son and Shahid is reluctant to tell his more traditionally minded mother about his marriage. Baljinder Kaur is perfectly cast here as Shahid’s mother and I loved how she managed to keep her family under control, even when they were all grown up. Mohammed Zeeshan Ayyub is also excellent in the role of Shahid’s brother Arif, and his frustration at always being the one left to look after everyone else is eloquently portrayed. Ayyub is another great actor who seems to have appeared in a number of good roles this past year and has the knack of making even a small role memorable. Although Hansal Mehta makes us sympathise with Shahid by showing his early struggles and his family life, the director doesn’t shy away from portraying his weaknesses. 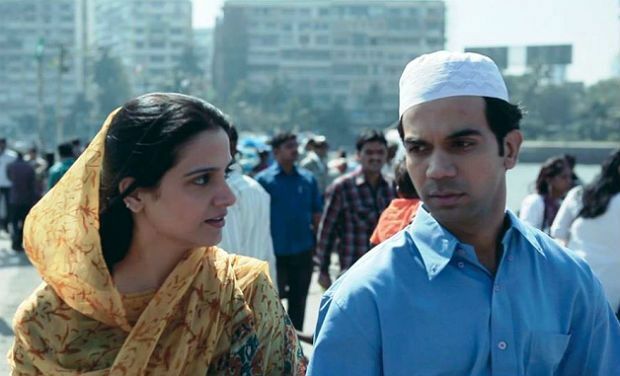 Shahid’s reluctance to tell his family about his new wife is shown as a flaw and he also has a general tendency to ignore problems by burying his head in the sand and hoping they will just go away. These failings do make him a more human and vulnerable character and contrast well with his more decisive and determined attitude when in court. Raj Kumar Yadav gets under the skin of a crusading human rights activist in the second half of the film and his passionate arguments are stirring and though-provoking. It’s another plus for the film that the court scenes appear realistic, set in dingy surroundings with harried looking judges. A case with a suspected terrorist shows the accused under guard in a metal cage,and only the various legal representatives allowed in the room which I can imagine is exactly how these trials are actually conducted. The verbal battles between Shahid and the various prosecutors, including his old employer Menon are also excellent and keep up the momentum of the film without getting bogged down in Shahid’s oft-repeated mantra “justice delayed is justice denied”. This is a well-made film with sensible and mature treatment of its subject matter. There are a few stumbles with Shahid’s early life and perhaps a little too much time spent on his developing romance, but on the whole this is a fascinating glimpse into the life of a man who took on the Indian legal system on its own terms and won. I do think it would have benefited from a more documentary style approach and additional information on Shahid Azmi’s cases would have made it seem less of an idealised account. However it’s still a worthwhile attempt at a serious biopic, and with excellent performances, realistic situations and an intelligent script it’s definitely one I recommend watching.